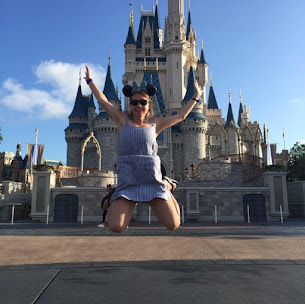 Running through the Storms: I miss Disney! A couple bloggers I follow are on their way to running the Disney Princess Half Marathon! To say I am jealous, doesn't even begin to describe my feelings about not being there. Drew & I were just talking about how we want to go to Disney World this summer, but we don't know how realistic that is with all of our medical expense and student loan debt. We trying to be "adults", but that seems to be so BORING! Some people have kids each year, but we go to Disney. You may recall my Disney Themed Wedding or you can go here! My obsession with all things Disney goes beyond therapeutic help and I am well aware of my disease. Check out our bathroom.. I have been meaning to post these pictures a while ago.. I told you the disease was bad! If we don't get to Disney this year, we will next year, especially with the Magic Kingdom expansion. It is the largest expansion Magic Kingdom has ever seen! I LOVE YOU EVEN MORE!! HAHA!! Krystle, When are you guys going?? I love Disney.. We had a Disney Themed Wedding.. I am kind of a Disney freak.. If my husband would allow, our whole house would be Disney... At Christmas, our tree is all Disney themed... It's a disease.